President Donald Trump’s new tariffs on Chinese goods focus on “parts” – intermediary goods used by US companies. The focus on “parts” could leave US businesses at a disadvantage to foreign competitors – the opposite of Trump’s stated goal. “Putting tariffs on intermediate products is shooting oneself in the foot,” said economists David Dollar and Ahi Wang. During his announcement of new tariffs on Chinese goods, President Donald Trump argued they were necessary to protect American jobs and strengthen the economy. But economists say one word keeps popping up on the list of goods subject to the tariffs that could undermine Trump’s promise. 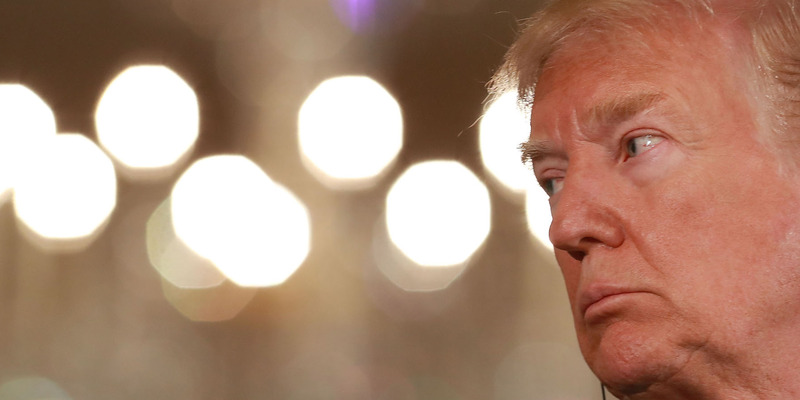 Chad Bown, an economist at the Peterson Institute for International Economics, said the focus of Trump’s tariffs on “parts” represents a danger to US businesses and workers. Trump may be trying to shield consumers from direct cost increases. But the focus on “parts” presents a larger problem for US businesses. Many companies rely on parts and equipment from China and abroad to produce finished goods made in the US. While the tariffs are meant to force these firms to start using-American made inputs instead of Chinese-made “parts,” that plan could end up backfiring. Bown went through the list of goods in the Trump administration’s tariff proposal list. He found that 85% of the goods are either capital equipment – such as large machinery used in the production of finished goods – or intermediate inputs, parts that make up a finished good. Companies could instead move the segment of the supply chain, such as the assembly of the final good, from the US to another country without a tariff and then import the finished good. That would avoid the tariff on the “part” but also cost the US jobs and manufacturing production associated with the business. Alternatively, US-based companies that export finished goods assembled in the US could lose a competitive edge if their imported parts get too expensive. “Trump’s plan means American-based manufacturing and service providers will find it increasingly difficult to compete with Germany, the United Kingdom, Japan, South Korea, and throughout Asia – where tariffs on parts and equipment remain low,” Bown wrote. For example, the Financial Times highlighted the case of Jason Andringa, who runs an Iowa-based business that builds drilling vehicles. The company uses cabs imported from China in their drillers, which are then sold in the US and exported around the world. The increased tariffs could lead to the company’s prices being undercut by foreign competitors, Andringa told the FT.
Jay Bryson, an economist at Wells Fargo, found that certain industries would see more of their intermediary goods subject to the tariffs than others. Bryson found that the most vulnerable industry was “other transportation equipment” – mostly aeroplane manufacturing. 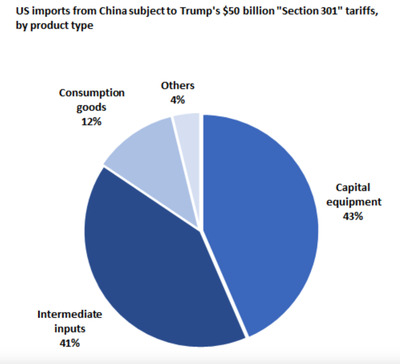 According to the analysis, 67% of the industry’s inputs – measured in the dollar value of those inputs – are subject to the tariffs. Other industries that could see over 50% of their intermediary good subject to tariffs were: electrical equipment, appliances, and components; fabricated metal products; plastic and rubber products; machinery; computer and electronic products. David Dollar and Ahi Wang, economists at the Brookings Institution, said the industries that will face the brunt of Trump’s tariffs are also among the most valuable to the US economy. Dollar and Whang also said the industries that will be hardest hit by the tariffs are the last ones Trump should be targeting. Parts that come from China that are added to high-tech products are typically cheap. But the assembly and components added in the US are more valuable, and therefore make up more of the products’ final price. In essence, they said, Trump is indirectly hitting goods that give the US economy more of a boost.